Why You Need To Track Conversions, Period. Conversion tracking and attribution is one of the most important things that a business can do, yet surprisingly, not everyone does it. Having your site properly set up can really make or break your marketing efforts, so we’re going to take a closer look at conversions, how to track them, and how to use the resulting data to help your business grow. Before we can talk about tracking, we need to discuss what a conversion actually is. Consider the purpose of your website. What do you hope people do when they visit it? A conversion can be any action that you want your visitors to perform while on your site. Common conversions include e-commerce transactions, video views, contact form submissions, visiting a specific page, document downloads, and mobile app downloads. Tracking conversions may be done through many platforms but for the sake of this post, we’re going to focus on Google Analytics and Google Adwords. For e-commerce sites, your sales data should be imported into Analytics. With most shopping platforms, the port to Analytics is easy, and will allow you to separate your shipping costs from your net revenue, as well as let you know when visitors use a coupon. Goal/Conversion tracking will appear in a few places within the Analytics and Adwords Platforms. Once set up correctly, you can get an immediate look at which channels are working for you under the Acquisition > All Traffic > Channels tab in Analytics. Why Do I Need To Track Conversions? You’ve got a nice website, it looks beautiful, and Analytics tells you it gets a lot of traffic. Since you put it up, business has increased, so it must be because of all your online marketing efforts, right? Not so fast. If your sales/inquiries increase, you don’t want to be using phrases like ‘I guess’ and ‘maybe’. You need to be able to tell exactly where your business is coming from. Let’s say you’re running 3 paid search campaigns in Ad Words with a $1500/month budget, splitting the cost evenly. After the first month, you notice that web traffic and sales have increased. Your first instinct might be to up your overall budget, but that's not the wisest course of action. Instead, you should look and see where the increases came from. This necessary research is downright impossible to do if you are not properly tracking your conversions. When you are tracking your conversions, you’re able to get a lot more granular, which allows you to adjust the spend of your marketing budget to get the most bang for your buck. I’m Tracking Conversions, Now What? Knowing the source of your conversions is great, but how exactly does that effect where you spend? In the Analytics interface, you can tell which campaigns converted, which can be very helpful when assessing different sources of traffic. What’s great about Ad Words is that it connects with Analytics and shares metrics. This means you can make changes based on what’s working and what isn’t. From there, you make adjustments to keywords and campaigns. You can test and make adjustments to metrics, which will help you get the most for your dollar - from ad copy, landing pages, and keywords, to specific times, days of the week, and demographic data. When the time comes to launch your website, there is always a long checklist of things that need to be done. While many of these things include basic site functionality (browser compatibility, responsive design, etc. ), it’s super important to include a checklist for your Analytics and Ad Words features. 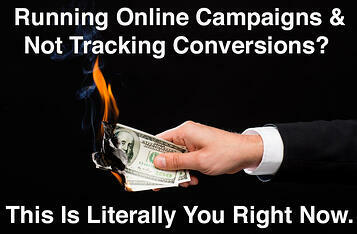 It makes zero sense to launch a campaign if you’re not tracking all the conversions on your site! As always, if you have questions on the details of how this is done, leave a comment below or get in touch with us.